Backpacks Mark Ryden - a high-quality products for people with excellent taste, leading an active lifestyle. If you value functionality and comfort, aesthetics and durability, then you will be able to choose your own backpack in a wide range of models from Mark Ryden. First, Mark Ryden backpacks catch your eye with their laconic and trendy appearance. The longer you look at them, the more you are convinced - there are not any unnecessary or missing details in the products. So everything is thoughtful, functional. Ultimately Mark Ryden will conquer you (as well as us in due time), when you first touch your backpack. Feel the quality of the hands of the fabric, accessories, make sure how easy it is to use. Mark Ryden is really quality and technology in every detail. 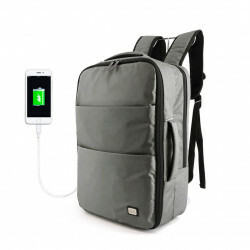 Such a backpack will be one of your most successful purchases, the best gift for yourself, your beloved, your son or your husband. He will serve for many years as a real helper in close and long trips, traveling.